We have a new guest reviewer tonight - moviemaniacks. 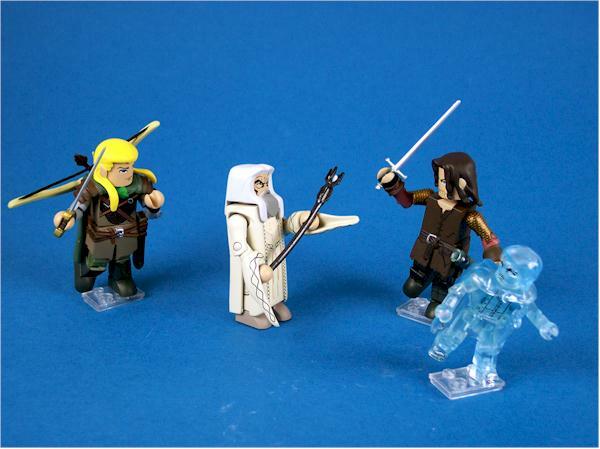 He's picked up one of the LOTR Mini-mates sets, and has a great review for us. Take it away! 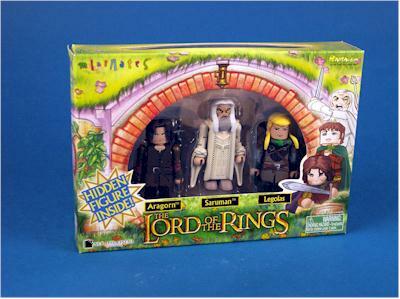 The first of many LOTR offerings from Art Asylum's mini-mates line has just hit shelves at TRU. 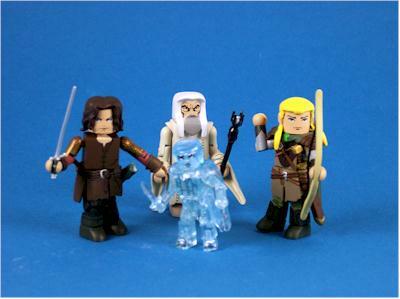 There are 2 sets, one includes Gandalf, Frodo, Gollum, and a bonus figure, and the second gives you Aragorn, Legolas, Saruman, and a bonus figure. Now, some of you may want to actually be surprised when you open your set, so if that's the case...! !DO NOT READ THIS REVIEW!! I'll be reviewing all 4 figures in the set, so if you don't want the surprise spoiled. Don't read on. I'll be honest, I love this packaging. It caught my eye on the shelf, and I think it's actually one of the reasons I picked up the set. It has great, colorful artwork that captures the feel of Hobbiton, and I also like the LOTR characters drawn in mini-mates style on the side. The window gives you a good view of the figures and their accessories, and it's also collector friendly. The picture you see is actually of the figures after they've been taken out and put back in the blister, I couldn't wait for the ride home to open it. The only part of the packaging that falls short is on the back. It shows only the two TRU exclusive sets, but I would've liked to see some of their other offerings as well. 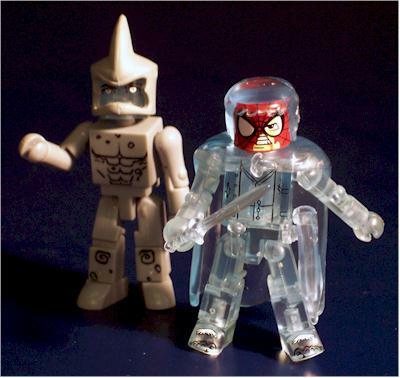 Most mini-figures are not highly detailed, and these are no different. However, the fine folks at the Asylum did a good job getting the major points of each character into the sculpt. 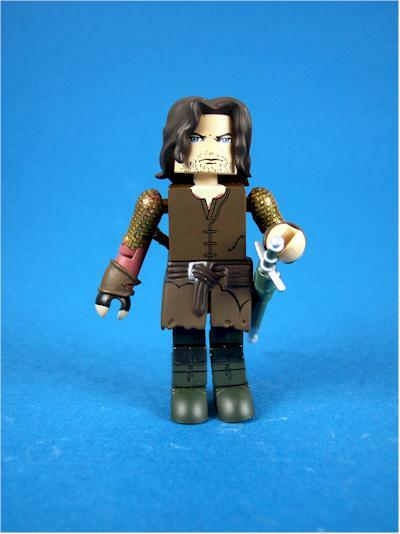 Specific parts of the clothing are sculpted, such as belts and shoulder pads, as are non-removable weapons such as Aragorn's dagger and Legolas' quiver of arrows. Frodo's sculpt is especially important, since he doesn't get the luxury of a paint job to accent his details. However, he also has enough to earn him 3 stars. Saruman is a little more underwhelming. His cloak has sculpted details on it, but I don't think there are enough cool little extras to put him in the same category as the others. One downside is that all the figures' hair comes off relatively easily, which makes turning the head frustrating at times. Also, the scale here is worth mentioning. 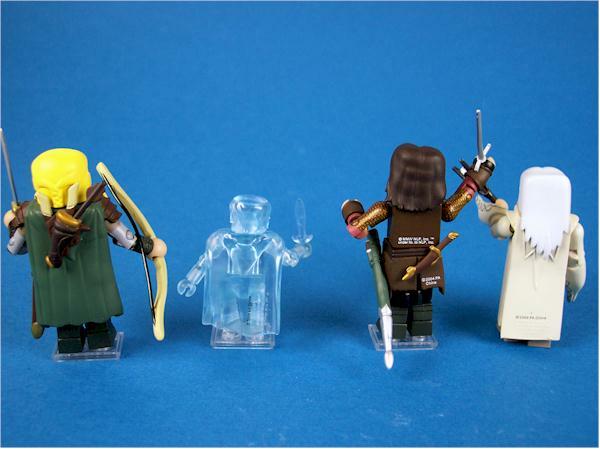 Most mini-figures don't attempt to create any sense of scale, but here they've made a difference between humans and hobbits. The humans are all the original 3" mini-mate scale, and the hobbits are the new "Marvel mini-mate" 2" scale. This is a cool extra that really adds character to the figures. 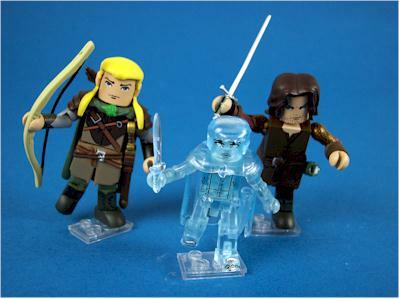 Once again, Aragorn and Legolas outshine the others in this set. Their faces capture the characters well, and they've gotten around sculpting limitations by using paint instead. For example, the paint app on Aragorn's arms look like chain mail, and there are details on Legolas' arms that look like his elven armor. Frodo actually doesn't have a bad paint job, just a non-existent one. However, the paint they did include looks nice. He has a very "Frodo" worried look about it, and they even painted on the one ring on his finger. Saruman however just doesn't have a very exciting or detailed paint app. The face also doesn't say "Christopher Lee" to me, but you may disagree. There is a little bleeding on his beard/hair, but not enough to bother me. Here is where the set becomes divided. While they all use the same body with 14 points of articulation, they all have different accessories that will affect this articulation. 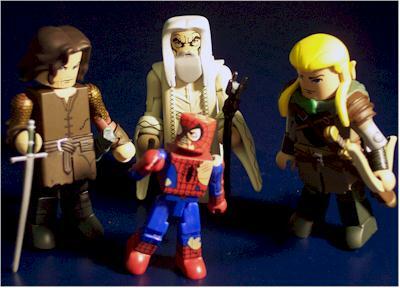 Frodo is only slightly inhibited in the arms by his cape, but you can still get a lot of cool poses out of him. Aragorn's legs are slightly covered by his clothing, which keeps them from moving side to side very much. 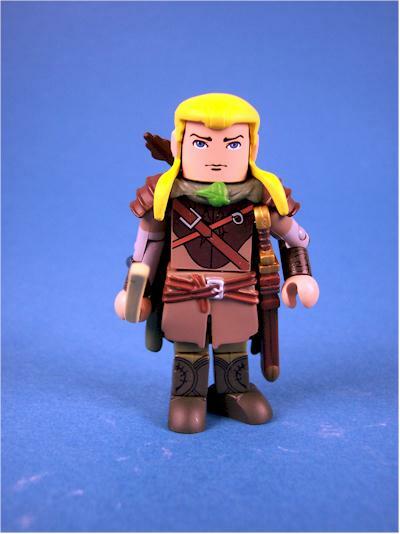 Legolas' legs are more encumbered, making his leg movement at the hips very limited. Saruman's articulation is almost completely useless thanks to his long cloak. His sleeves also make it difficult to get his staff in his hands. However, the ball jointed heads are all nice, it's a shame they couldn't find a way to incorporate all the cool features the figures have while still keeping the 14 points of articulation useful. Art Asylum outdoes many other mini figures in this department as well. The 3 members of the fellowship each have a sword and removable scabbard, and the swords can either be held or put in the scabbard. You can also see the runes on Sting, which is a cool bonus. Legolas also has his bow, of course. Saruman only has one accessory, his staff. While I can't think of anything else practical he would come with, I don't think he deserves the same score as the others in the set. One thing I found was that the accessories fall out of the figures' hands pretty easily, so if you're so inclined you may want to just glue them in. 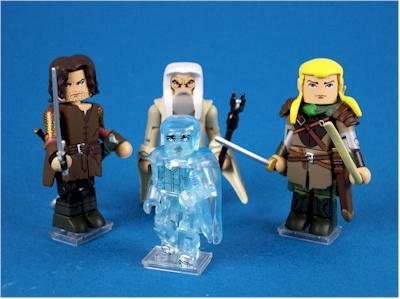 Another new thing from the Asylum is the inclusion of LEGO style bases for the figures. With them you can spit in the face of gravity and have them displayed on one leg, kicking or hopping as you see fit. They work well, but they are also easy to knock off the bases. My set only came with 3, I'm not sure if that's a mistake or not, since Saruman really doesn't need one. All in all a very cool bonus. Kids will most likely get a kick out of these stylized versions of their favorite LOTR characters. There is enough articulation to play around with, but the difficult to hold accessories may get frustrating if someone actually tries playing with them. 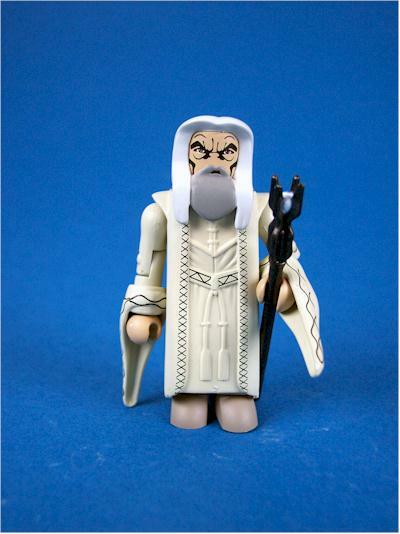 Saruman is not a very kid friendly character, and his figure reflects that. This would be the one thrown into a box and forgotten about. This set was $10 at TRU, and that's the only place to get it, so there's not much you can do about the price. Considering that the Pulp Fiction GEOMS go for $20 for the same amount of figures, and that this is an exclusive, I'd say you're not doing too bad. I feel better paying $10 for these than $9 for the Marvel mini mates thanks to the detailed paint, cool sculpts, larger scale, and the bases. You can't find mini figures of this quality for much less than this. Not a steal, but you could do worse. 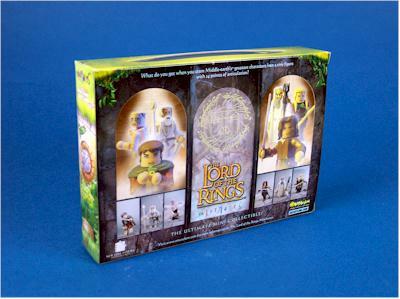 This set has a lot to offer if you like LOTR and/or mini mates. New representations of classic characters, appropriate and cool accessories, nice paint apps, and a decent value. However, the inhibiting clothing/accessories and easily lost accessories proved too frustrating for me to award a 4 star rating. If you don't like mini figures, chances are this set won't sway you. But if you do (or don't mind them), this is definitely worth checking out. This is a TRU exclusive, which means that's where to get it. Amazon.com will probably have them too. Figure from the collection of moviemaniacks.